Qatar Diar Company may invest $1 bn in Khazar Islands project and management of the project can be intrusted to famous UAE’s Nakhill company. President of Avesta concern Haji Ibrahim Ibrahimov told APA that during recent visit to Qatar, Avesta leadership met with country’s OM, FinMinister and President of Qatar Diar Company. 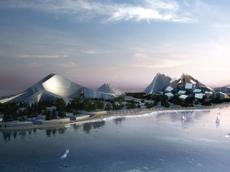 According to initial talks, Qatarian side can invest in the project up to $1bn. Besides, famous Nakhill company has appealed Avesta and expressed intention toward the management of the project. In the coming days, representatives of Euro-Atlantic Investment Fund comprising also investors from the US, Canada and Europe will visit Baku in order to acquaint with the project. The first foreign investor has already been attracted to Khazar Islands – an initial agreement has been signed with Turkish Sema company on allocation of $50 mln invest. In general, nearly $1.4 bn capital has been invested in the project, so far. Note that, currently, the project continues to build 1130 apartments with a total area of 200 square meters. At the same time, the complex is building a bridge at 324 meters long, the length of the span - 50 feet. 4.5 km boulevard of the complex is filled with concrete. At the same time, the complex continues to build 10 restaurants, which should be completed in September. Moreover, the complex has established a brewery. The plant, to be commissioned in August, will be produced 16 kinds of Khazar Islands beer.